A mere two weeks after Hurricane Irma barrelled through the Caribbean, there’s yet another Category 5 hurricane that’s wreaking havoc in the region. After inflicting “widespread devastation” to the island of Dominica last night, Hurricane Maria is now making a beeline towards the US Virgin Islands and Puerto Rico. Maria regained its Category 5 status earlier this morning after temporarily dipping to a Cat 4. The ferocious storm directly hit on the small Lesser Antilles island of Dominica at around 9:00pm local time, lashing it with 160 mph (260 km/h) winds. The extent of Maria’s damage will emerge in the coming hours and days, but it doesn’t look good. As Weather Underground reports, several weather stations were knocked offline during the storm, including one at Canefield Airport. Maria marks the first time that a category 5 has struck the island of Dominica, which is home to about 72,000 people. This is now the second Category 5 to emerge in the Atlantic this season, Irma being the other. The other times that two Cat 5s have erupted in a single Atlantic season, since records started being kept, were in 1932, 1933, 1961, 2005, and 2007. 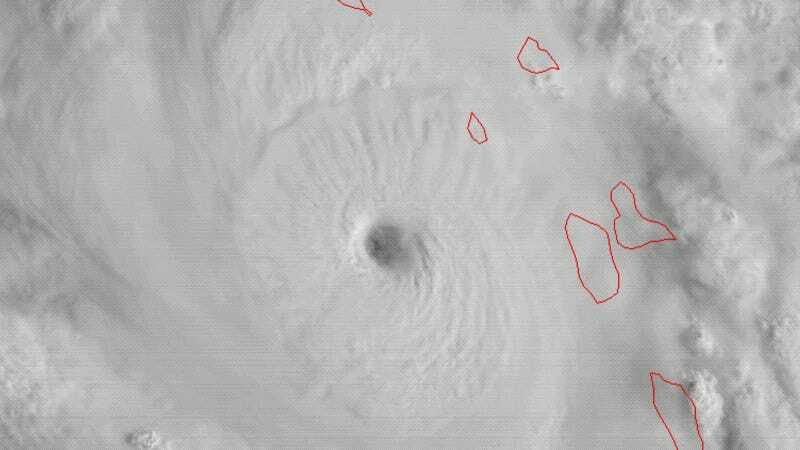 Maria has a relatively small eye, measuring just nine miles across. This has constrained the most intense winds to a relatively narrow 40-mile diameter around the storm’s fast-twirling center. That said, tropical storm force winds are extending out for 230 miles. If all this sounds very sudden, that’s because it is very sudden. Maria underwent a rapid transformation yesterday, escalating from a Category 1 storm to a Category 5 storm in just 24 hours. The storm passed through some of the warmest waters recorded this year in the Caribbean, giving it a tremendous boost. Hurricane warnings are now in effect for Guadeloupe, St. Kitts, Nevis, Montserrat, US Virgin Islands, British Virgin Islands, Puerto Rico, Culebra, and Vieques. “Some fluctuations in intensity are likely during the next day or two, but Maria is forecast to remain an extremely dangerous category 4 or 5 hurricane while it approaches the Virgin Islands and Puerto Rico,” noted NOAA’s National Hurricane Center in a public advisory. Maria is currently 85 miles (135 km) west of Guadeloupe and plodding along at just nine miles per hour (15 km/h). It’s expected to make a direct hit on Puerto Rico later today and rake the territory over the next two days. In addition to high winds, there’s the threat of storm surges and intense rainfall. Puerto Rico and the US Virgin Islands are projected to receive storm surges as high as six to nine feet, and rainfall accumulations between 10 to 18 inches. Some regions could experience 25 inches of accumulated rainfall. President Trump has issued an emergency declaration for Puerto Rico, offering federal assistance to supplement the territory’s own emergency response. Evacuations have been ordered, and citizens are streaming into the country’s 500 storm shelters. Irma’s tropical force winds skirted the island two weeks ago, but the US territory is now directly in its crosshairs; it could take two and a half days for the storm to move through the region. “This is an event that will be damaging to the infrastructure, that will be catastrophic, and our main focus—our only focus right now—should be to make sure we save lives,” said Puerto Rico governor Ricardo Rosselló. After Puerto Rico, Maria is expected to brush the northern coast of Haiti and the Dominican Republic, and then move upwards as a Category 3 storm towards Turks and Caicos, and possibly the eastern Bahamas. It’s too early to tell if the US eastern seaboard is at any risk. Meanwhile, Hurricane Jose continues to churn as it drifts northward. And as meteorologist Philip Klotzbach points out, it’s now the longest-lived Atlantic hurricane of the 2017 season. Jose isn’t expected to inflict much damage, but high seas and riptides are predicted this weekend off Cape Cod and Nantucket.